As Halloween comes around every year, I naturally think about all the fun I had in Newark, dressing up for school parties and roaming the neighborhood in search of treats. 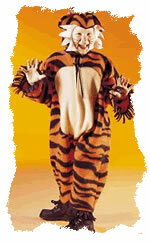 My earliest recollection of the fun day involves wearing a tiger suit to school—think it was the first grade maybe—complete with tail and headgear with pointed ears. I remember zooming through the Abington Avenue school playground and feeling this neat “twang” as someone stepped on my tail, neatly separating it from my beloved costume. Can’t be much of a ferocious tiger running around all day with your tail in your hand. After that my costume was pretty much a variation on a common theme, the down and out man—hobo, beatnik, and pirate. It was cheap and effective, got the goodies, with no tail to lose or expensive costume to get ruined. Guts and gore, as it is today and was to a limited extent back then, was not my speed. Not too many elaborate Halloween lawn displays back then either. Today, folks go all out for show. I have seen some streets so mobbed with traffic and kids coming to view the eerie displays that afterwards the neighbors who put it all up were forced to move lest their enraged neighbors make it possible for them to become part of the actual display next year! I am told that the crème de la crème of payback reserved for really sully neighbors was a nice choice Idaho potato rammed up the old muffler pipe. It made such a delicious “Kerblam” out of the muffler, followed by that Harley Hog sound of the exhaust….Blatta, Blatta, Blatta. The engine ran for maybe 3-5 seconds before ignition of the muffler was achieved. I only heard the sound once and it is unforgettable—from a considerable distance of course. I understand in Detroit they regularly burn their city every Mischief Night. Tough town. Dad had this horrendous gorilla mask that he just loved to wear on Halloween. He would hide near the house and wait for his special victims, rowdy teen-agers; and very often on Mischief Night to nip any suspicious activities in the bud. I have seen that old mask help launch new land speed records as Dad came loping out of the alley or from behind a car beating his chest like an enraged gorilla. One poor kid went off our elevated porch with his feet pumping in mid-air, hitting the ground running, leaving skid marks--- and I swear to this day, visible smoke. My Halloween bag (usually an old pillow case) often contained some miniature candy bars, candy corn, apples, some pennies and nickels, Mary Janes, jelly beans, and assorted tooth decay promoting agents. It was just glorious to simply smell the bag as you walked along. My neighborhood had lots of 2 and 3 family houses, so pickings were pretty good. One solid block of houses could easily fill a bag. Most of the Trick or Treating took place after school. Night visits were not allowed in our house, except maybe if you went with your parents to special friends and family homes. Someone always remained behind to answer the door and make sure the dog didn’t go bonkers whenever the doorbell rang. Halloween’s a quaint custom that never seems to go out of vogue, something I always associate with the falling leaves and Autumn chill in the air. It takes me back to slate sidewalks, tightly packed houses, and lots of kids going door-to-door. It’s a cherished Newark memory that comes visiting this time every year, reminding me where I came from and the wonderful things that shaped my childhood. What great fun I had growing up in Newark!